listen to episode 27 - hit the play button! In life, nothing great happens fast, unless you’re in a jet... This week we’re talking about the Hawker 800XP, an aircraft we’re currently doing a prebuy on. Then, another new AD issued by the FAA that affects some Piper airplanes; listener feedback about the Cessna Conquest, 2 meet ups, and new members to our Plane Partnership Program. Plus, aircraft ownership news, the tip of the week, and an after show! 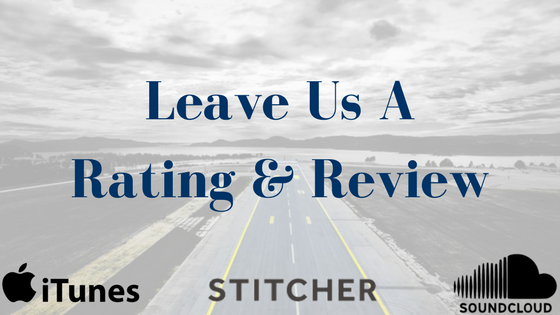 We value your listenership and your opinion! Please take a minute to fill out a short survey so we can get to know you a little better and find out how we can improve the show. If you’re interested in becoming an aircraft owner, sharing your costs is often the most practical solution. Whether you’re looking for a co-owner or lease partner, our Plane Partnership Program might be for you. With a partnership, aircraft ownership becomes more accessible and more affordable than ever before. Your acquisition, maintenance, and ownership costs are literally a fraction of sole ownership, without compromising flexibility or safety. Our program works for a wide range of situations including personal, business, or corporate travel; co-ownership, cost-sharing partnerships, flight training, and leasebacks.